Today I’m sharing how to build a photography backdrop that can be used as a canvas for food, products and crafts. This project is very easy to assemble and takes just a few materials to get started. I’ve spent many hours researching how to build one and to be honest, I’ve spend a great deal researching stains for the wood too. What it came down to was actually going to stores and checking them out and then testing them on the backside of extra wood I had. Stain can be a pain to deal with, from the splatters and spills to instantly dry brushes and liners. I’m sharing this useful hack to make the project a little less messier. By using Glad Press’n Seal from Walmart this project took just a couple hours to complete and saved my both money and time. When dealing with stain, it’s very common for brushes to dry out fast if not covered. Here, I’ve covered the brushes between coats, ensuring that my brushes don’t dry out and get thrown away. 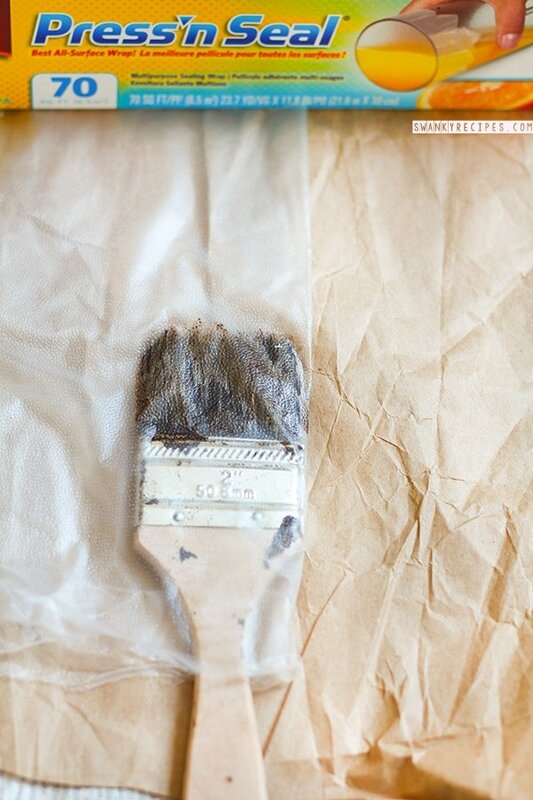 Using Press’n Seal to cover the brushes is the perfect hack to ensure the brushes stay wet for days. Throughout the years, I’ve thrown so many stain brushes away because they simply dry out within the hour and don’t wash very well. I’ve also used it to cover my work area because stain drops fly everywhere and it can be a disaster. 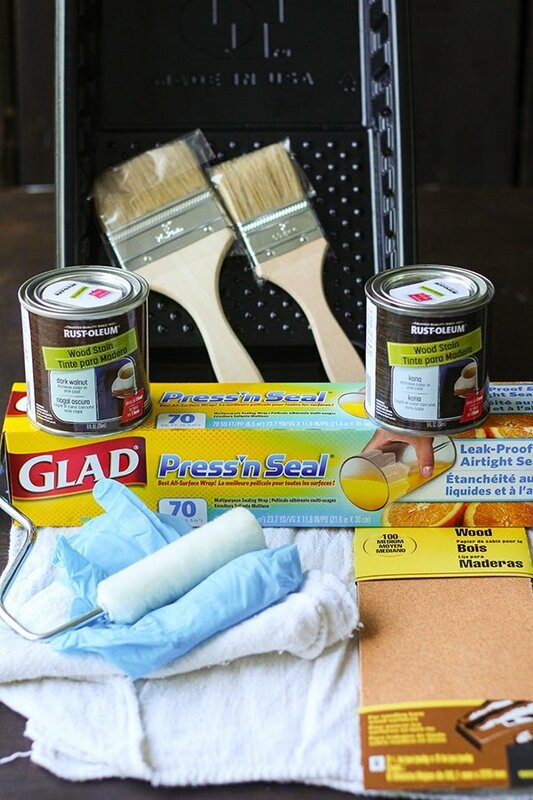 For the project, you’ll need Glad Press’n Seal, 100 grain sandpaper, a few paint brushes, gloves, rags, paint liner, Rust-oleum Wood Stain in Dark Walnut or Kona and wood. Wood can be picked up from a home improvement store or it can be any wood laying around that is dry. I’ve used 2 by 4s for the first backdrop and a plywood sheet for the second. The 2 by 4 wood is cut to about 45 inches tall and about 6-7 boards total. Sand each piece of wood and wipe it down with a rag before setting up the work area. Lay down long layers of Press’n Seal and tape it at the seams to make a waterproof work station. Cover the paint liner with Glad Press’n Seal. 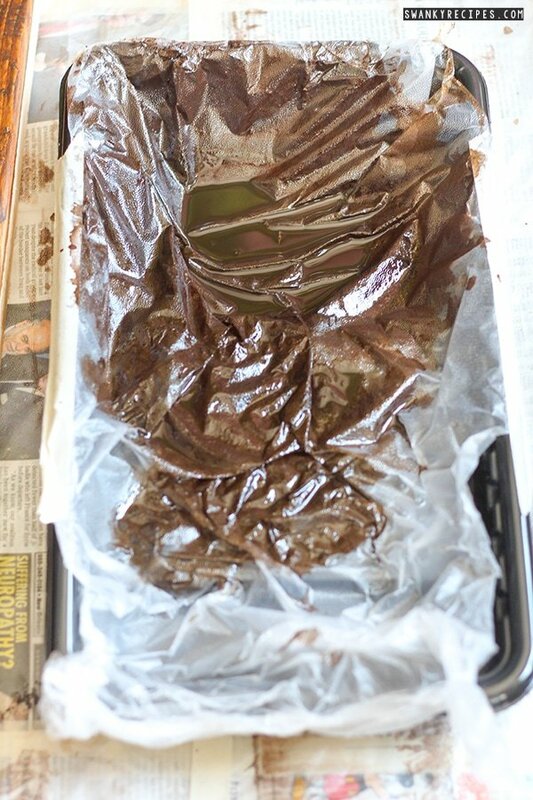 This will ensure that it won’t dry out and even if it does, it can be peeled back and thrown away without tossing the liner or extra materials. Open the stain and stir it then pour it into the prepared liner. Using a paint brush, dip the end into it and stain the wood. Just a note that stain is liquid based and has a tendency to leave droplets everywhere, even if you’re not rough with the brush. Just be sure the area is covered well and to use light hand strokes. An important note here about the wood. Some wood absorbs more liquid than others. This is the case with the plywood I used. The stain was instantly absorbed. 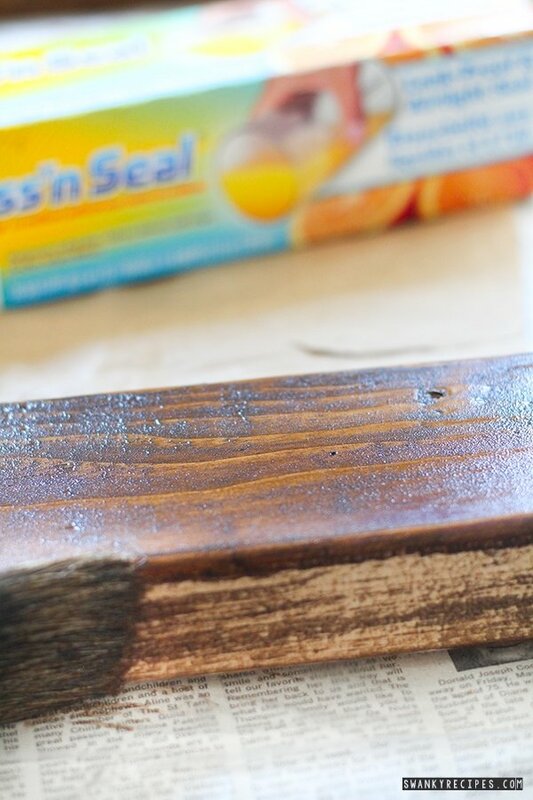 To give it a weathered look, use a rag and push on the wood hard to wipe away some of the stain. Since the wood absorbed the liquid, not much should come off, but it will leave a two-tone color that is beautiful with pictures. If the wood doesn’t absorbed liquid but rather the stain has to dry on top of the wood for an hour, the rags are not needed. This was the case with the 2 by 4s I used to which I added a second second coat to a few of them. Stain the sides of the wood. The side of the wood has a habit of showing when taking pictures, therefore it’s best to stain the edges. Between coats, wrap the brush in Press’n Seal. Cover the paint liner with it as well. This hack saved me tons of money and trips to the store. It will stay moist for a few days if properly sealed. To find more hacks using this product, check out this useful page here. 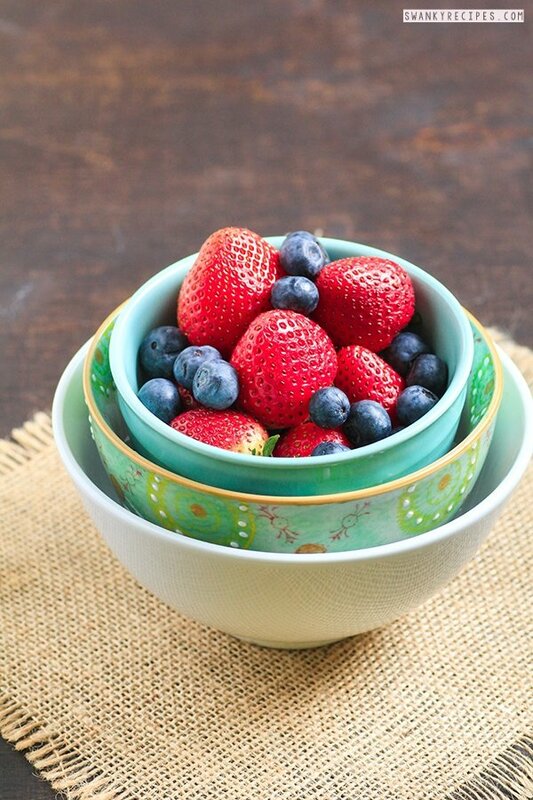 Cleanup is easy and takes a few seconds. 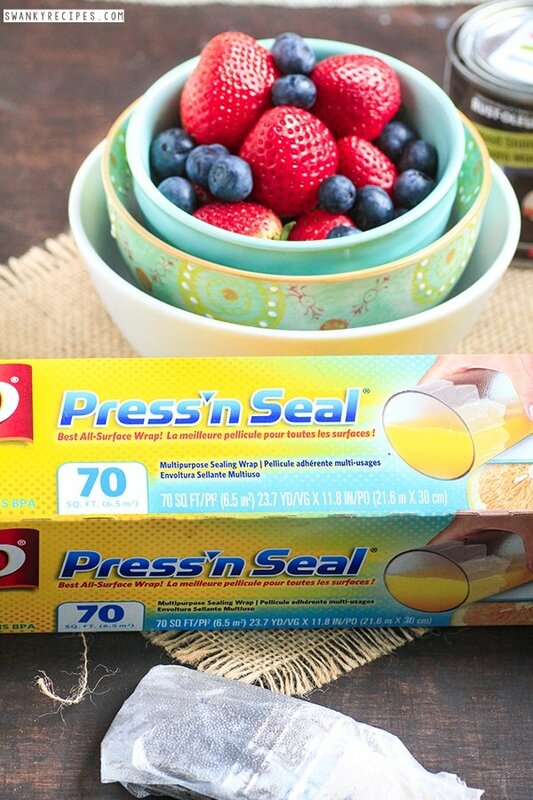 Peel off any Press’n Seal and toss it! Allow the boards to fully dry before using. Experimenting with different types of wood can create different backdrops all while using the same stain color as seen with these two photos. 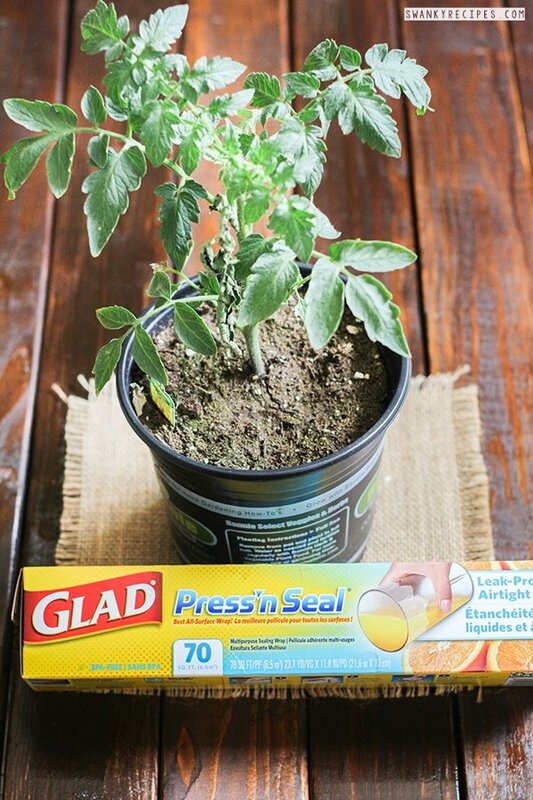 For more Press’n Seal hacks, check out their Facebook page and Pinterest.